Due south some 300 miles from the town of Albany, Oregon, rest a true jewel of natural wonder. It’s a journey with views of majestic ocean landscapes, Earth-bound sea ships, and greetings from a Tyrannosaurus Rex… just to find yourself in a land of subtropical beauty and of ancient trees. A place where films and folklores have captivated the imagination, and more often than not pertaining itself the “bucket list’s” of travelers from around the world. And there is only one such place like it. Giant Coastal Redwoods of the Newton B. Dury Scenic Parkway. Like any well appreciated journey it takes a contrast of land, climate and culture to fully set our hearts in view of amazement, attentively soaking in the changing scenery. But before my eyes could take gaze upon such beauty as the Redwood Forest, I had to first set off from the cool environment of the 45th parallel. My red-eyed departure began as a cold, dark and wet drive. And after a five-hour cruise I eventually landed my feet in the town of Brookings. As the most southern situated coastal town in Oregon, Brookings lies under a unique jet stream (Conditions known as a “banana belt”). Typically this town experiences a warm and mild climate comparable to California’s central coast. Of course today Oregon had to ring true of its reputation. 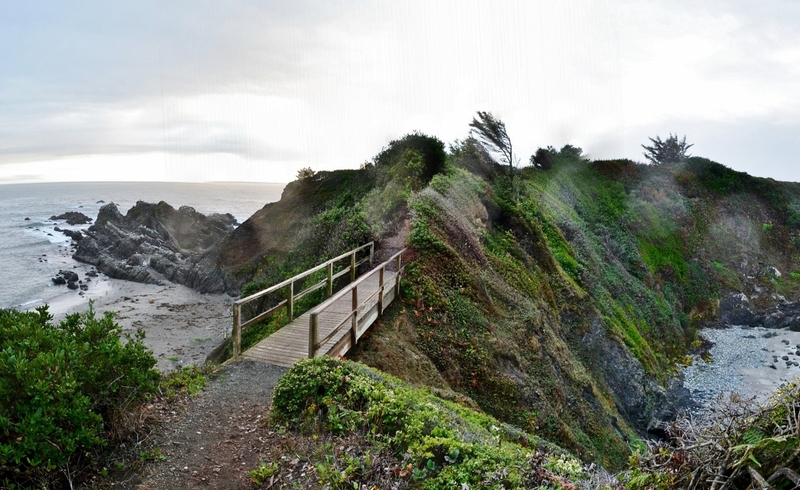 Chetco Point – Brookings, Oregon. Clouds and mist disguise an otherwise sunny and delightful beach. A coastal mist and light rain blocks the sunshine. Besides some washed ashore kelp and a few curious seagulls todays beach resides barren with life, an atmosphere persisting for solace. Only the rocks and the sea waves seem to cheer, clapping their hands together while the sun tries to make a peak through the cloud curtain. Minutes later, however, the sun eventually calls it a night as do I. The California border sits just beyond the horizon, almost a stones throw. Another day arises and the journey continues forward. Today we cross into new boundaries, particularly the California border. With the Sun smiling its warmest I couldn’t have asked for a more beautiful day. While taking in the sights of the drive I eventually arrive in Crescent City, where I enjoy a Sun-basking walk by the pier. Only yards away rest one of California’s oldest historical landmarks. 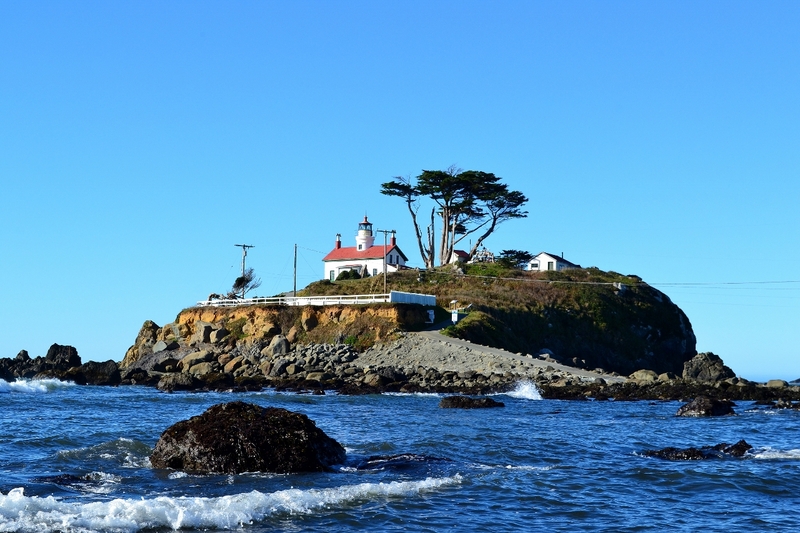 Dating back to over 150 years since it first opened in 1856 is the Battery Point Lighthouse. First opened in 1856, the federal government had dedicated $15,000 to the construction of the Battery Point Lighthouse. Just south of Klamath on Route 169 stands the Tour Thru Tree (speaking of bucket list’s). 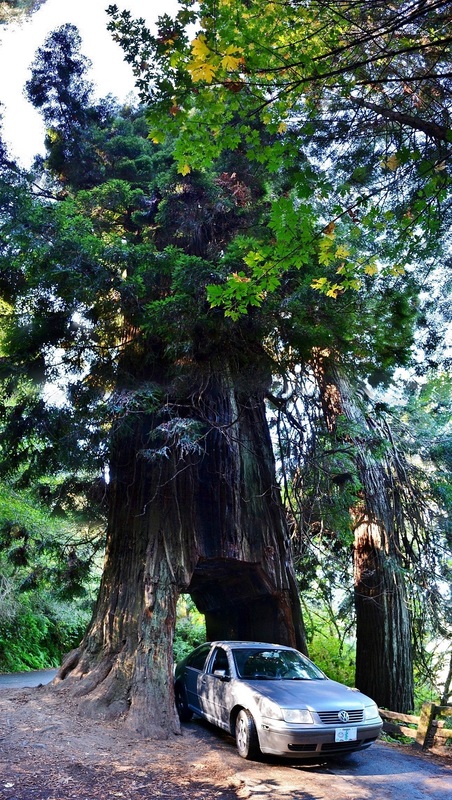 This 750 year old Redwood is 15 feet in diameter and is wide enough to drive a car through, hence its name. A true survivor, it has lived through toppling storms, ravishing forest fires and now a 7″ X 9″ hole which was carved through its trunk. I couldn’t help but drive, walk and smell tour thru this tree. Admission is $5 per car and $3 per motorcycle. Tour Thru Tree Redwood in Klamath, California. 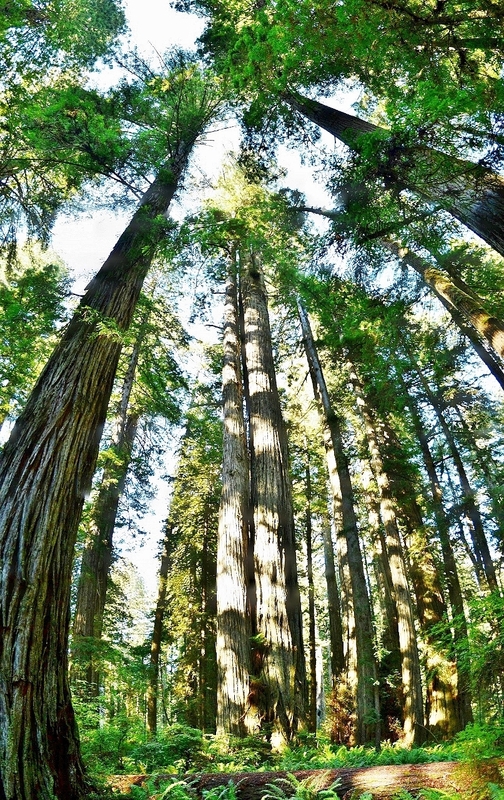 When settlers first came to California the redwoods covered almost 2 million acres. At that time their tools had little to no impact in the felling of the trees. By the 1830's, however, advancing methods in harvest technologies brought new sawmills on the scene and in full operation. The consistently straight-grained, durable, rot and termite resistant wood was highly desirable and thus a jackpot for the lumber industry. Today only one eighth of the original forest still stands. Humans have not always been the only contender of the redwood. 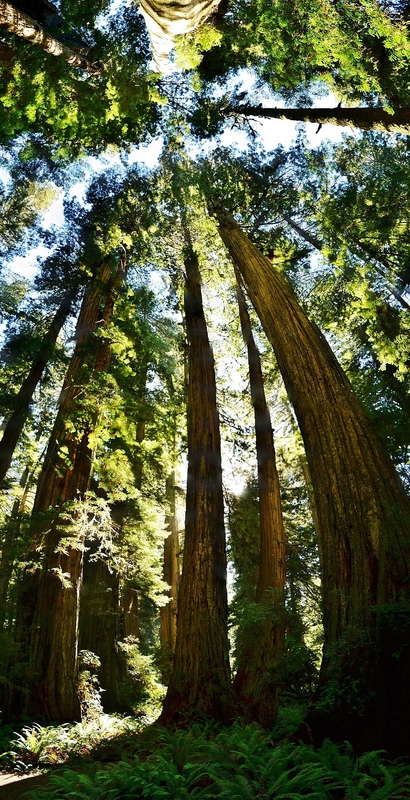 Throughout the centuries redwoods have consistently battled against floods, forest fires and stormy winds. Yet by design they have within themselves remarkable defenses. A thick canopy of tree tops absorb and disperse even the most relentless winds, creating a protective barrier within the forest. In times of severe flooding the soil may wash up creating deep mounds around the trunk. Rather than being smothered redwoods will sprout new roots adjusting to the rising level of dirt. They are also substantially fire resistant. During wildfires they protect themselves from being scorched to death in three ways: An ultra-thick layer of bark (up to a foot), a considerable amount of water in the wood itself, and the absence of flammable pitch (as found in most conifers). And when a tree does nearly burn down, it will heal and rejuvenate itself. For these reasons the trees live to incredible ages, sometimes thousands of years old! There are redwoods alive today that grew in the days of Christ. No wonder it has earned itself a nickname like the "Immortal Tree". For what felt like October weather back in Albany actually felt like May weather in northern California. Back at home nature was beginning its dormancy, but here the wild edibles were fully producing. Sure my mind was more focused on the surreal beauty of the redwoods yet I couldn't help but take notice of the few edibles that I did see. Here's a list of some that were looking pretty tasty. To all who have never been, I say with full confidence “a journey to the redwoods is an experience you will never regret!”. My one and only regret was not having the necessary time to completely get my fill to a level of satisfied contentment. With that said you can bet there will be more trips for me in the near future. Next Foraging Fiddleheads from the Lady Fern.